Governor Edmund G. Brown Jr. will be the featured speaker at the annual Sacramento Host Breakfast on May 24, co-sponsored by the California Chamber of Commerce and the Sacramento Host Committee. 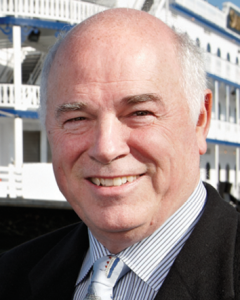 Also speaking at the breakfast will be 2018 CalChamber Chair Terry MacRae, CEO, president and founder of Hornblower Cruises & Events. The Host Breakfast provides a venue at which California’s top industry and government leaders can meet, socialize and discuss the contemporary issues facing businesses, the economy and government. Leaders from business, agriculture, the administration, education, the military and legislators from throughout the state are invited to join the discussion. Kicking off the Sacramento activities on May 23 will be the CalChamber Capitol Summit. 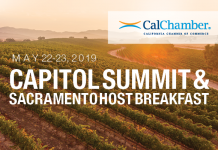 The half-day summit features political insiders and CalChamber policy advocates who will speak about election year politics and state policy issues. Zaremberg also will moderate “Capitol Scoop: Today’s Political and Policy Issues” with Andrew Acosta of Acosta Consulting and Karen Hanretty, a public affairs consultant. • Presentation of the President’s Circle and Small Business Advocates of the Year award. • A post-lunch panel discussion at which CalChamber policy advocates will provide updates on hot issues, with the Honorable Mike Villines, a former Assembly Republican leader and owner of the Villines Group LLC, acting as moderator. The subjects for discussion will be selected closer to the Summit date. Another option for Summit attendees is to stop by the CalChamber International Forum (a separate RSVP is required). The forum will focus on trade issues for the California trade/business community, including the consular corps, Export Council members, local chambers of commerce and more. Forum speakers will include longtime Capitol journalist Dan Walters, now with CALmatters, presenting an international overview of California; and Christopher Thornberg, Ph.D., founding partner of Beacon Economics, presenting an international economic overview. Scheduled for the evening of May 23 is the Sacramento Host Reception. This event is co-sponsored by the CalChamber and the Sacramento Host Committee to provide networking opportunities for business leaders from all industries in California. The reception also allows attendees the opportunity to discuss key issues facing the state with other business leaders and is a prelude to the Host Breakfast the next morning. The registration fee to attend the Capitol Summit, Host Reception and Host Breakfast is $75/person. The registration deadline is Friday, May 11 OR until sold out. Space is limited. For more information or to register, visit www.calchamber.com/2018summit-host.